If you're celebrating the beautiful day of Easter with family and kids around, I have some cute ideas on how to decorate for a garden party inspired setting. Plus, I'm giving you some super fun FREE Easter Printables to download and make your table cute and fun! Let's start talking about the table . . . I used a kid's vintage table and fun non-matching chairs. I love how all the different chairs looked and how all the colors blend well together. For the tabletop, pretty party paper supplies from BerryPom and James were used including pink and mint paper plates, along with matching napkins. I also used adorable flatware from Sophistiplate. Aren't they the cutest? 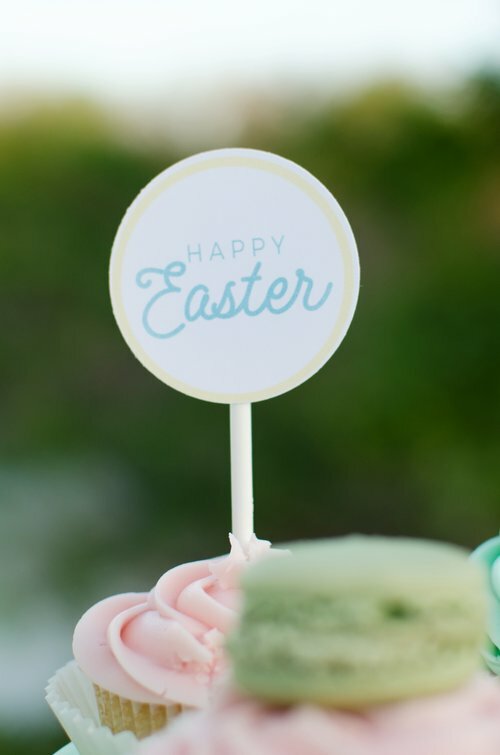 Sign up with your email address to receive the latest party inspiration and exclusive access to the Easter Party Printables showcased in this blog post. I also added a sweet mini cupcake on the cutest mini cupcake stand from BerryPom and James. I used a milk bottle type of glass as my cups and I used my wrappers to decorate them, and guess what? You can download them for free at the end of the blog post! I also used some paper straws that I got at Target last year... aren't they cute? As for the table runner, I just used a soft and sheer pink fabric that I gathered together towards the center for pretty draping and I added some mini nests and Easter eggs for the centerpiece. Now lets talk desserts. I wanted to display my desserts in a different way this time, so I used a mint colored shelf that I had on hand. It had previously been used in the Boho Chic party I styled a few years ago. My friend Marta from Sweet Carousel Cake, made me most beautiful cake to match our free printable collection. She also made me some mint and pink cupcakes and I used some pistachio macarons and my cupcake toppers to dress them up a little bit! You will be able to download these toppers for free at the bottom of the post. She also made me some cookies. These are some close up pictures of the shelves and what I put on them. On the first one, I added an Easter tassel garland from GlamFete. And, here’s another Tassel Garland you may also like . . . I bought some cute little bags that I found at Target and displayed them at the bottom of the shelf. Next to the shelf I put a kids' yellow chair, some light pink tulips in a glass vase, and a cute pink basket filled with colored eggs. To raise the basket I used a mint colored cake stand that I bought from my sweet friend Lori from Giggle Living. I hope you really liked this Easter Garden Party, please let me know in the comments section which free Printables you would love to see and don't forget to subscribe to newsletter so you can always be one of the first to get party ideas in your inbox and free printables. If you're already a newsletter subscriber, here is the link to your Free Easter Printables.